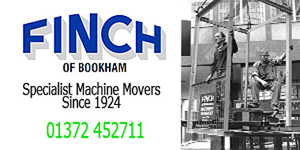 "As part of a recent large scale building refurbishment Finch's have been responsible for moving all of the large, delicate and often very expensive lab and workshop equipment, as well as staff. Nothing has proved too much of a problem even when on initial inspection the job seemed insurmountable. The professional and amazingly positive attitude of all of the Finch's operatives has made them a trusted contractor and a pleasure to work with. Without their help and expertise this project would have taken longer, been more expensive and certainly more stressful. Thank you." "We are using Finch to distribute over 250 baling machines into Waitrose stores throughout the country over the next 12 months. All ready half way through the contract we have been really pleased with the "can do" attitude the drivers have. 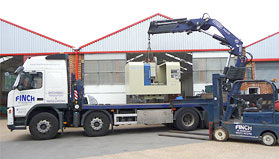 We would recommend their services to any one under going such a project, or just a one off machine delivery" J.D. "We rely on Finch of Bookham as sole supplier for transport and installation requirements for our Precision CNC Machine Tools. They are a family run business small enough to give a very personal service, but large enough to handle large installations and complete factory moves for us. Every job is different but Finch have the expertise to make life easier for everyone." "W. Finch & Co have been our approved specialist lifting, rigging and transport contractor since 1992. 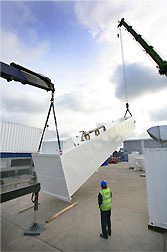 On a regular basis they assist us move components within the UK to our works in Aldershot, then the dispatch of the finished plant which ranges from 2 - 25 tons at a cost of several hundred thousand pounds. Always willing to help. from the office to site staff, Finches always give us a personal service which helps the jobs run smoothly." G.B.